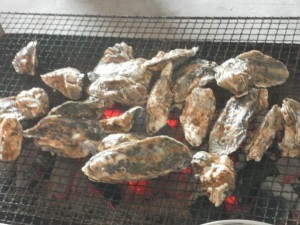 Nobuko, world traveller and occasional guest-blogger, is reporting from Malaysia and India (February 2013). The second leg of my year-long trip began in Japan. I had some rare reunions which were fun! And I got to meet my 6-month old nephew, a new addition to the family. I got to eat raw and grilled oysters and noodles like there is no tomorrow. I had my fare share of sake and shochu as I had nighty-night drinks at the end of the day… So, no wonder the time in Japan and the preceding month in the U.S.A. put back all the weight I had lost (8 pounds), and hence my mother’s comment “You said you lost weight, but it does not look like it”. From Fukuoka, I flew with China Eastern via Shanghai to Kuala Lumpur (KL). I do not recommend China Eastern to anyone. The layover in Shanghai was supposed to be only 3 hours, but it became a horrible 8-hour wait without any announcement of a clear explanation. And they changed departure gate three times, again without a clear announcement. Anyway, I arrived in Kuala Lumpur at 5 a.m. I wanted to go to Pulau Pnagkor, but the first bus from the KL airport did not leave until 9:30am. I killed time by taking advantage of using its free wi-fi. The bus was served by Star Shuttle, with very comfortable seats and a blasting AC. The trip was supposed to take 5-6 hours, but we made it to Sitiwan in 4.5 hours. From Sitiwan, there are buses to Lumit 10 km away which has a ferry dock to Pulau Pangkor. The ferry ride was 40 minutes and the round trip ticket was 10 MR.
Pulau Pangkor does not have buses, so I had to get a taxi which was 15 MR – very expensive considering a mere 4 km journey to Nipha Bay, on the west side of the island. There are tons of guest houses there, but cheap ones are not in abundance. I settled in a Nipha camp dorm for 20 MR. I like beach towns. I like reading while lying in a hammock. Basically, I don’t do too much of anything. But this time, I met a mother-daughter team from Japan. The mom wanted to go on a scooter ride, but both herself and her daughter were scared of driving it. Hence I came into the picture as a driver. It had been well over 10 years since I drove a scooter (in Thailand), so I was a bit scared myself – especially when I saw that the vehicle they gave us was not a scooter, but a small motorcycle (1000 cc). I practiced for 30 minutes going up and down the same street. Then I got the mom on the back and made a circle around the island. After about 30 minutes, I got the hang of it and I was able to enjoy the ride and the view. Just as Chinese New Year rolled in, I went back to KL. KL is a wonderful city! Bukit Bingtan’s Alor street has loads of eateries and come alive after dusk with neon signs and crowds of people. I met a friend of my friend there and we had dinner. I really wish that I had given more time to Malaysia instead of only just one week. The locals are friendly, food is great, and the infrastructure is good. From KL I flew Air Asia to Chennai, India. I had no particular reason to go to Chennai, but I wanted to see a sea side city in South India. 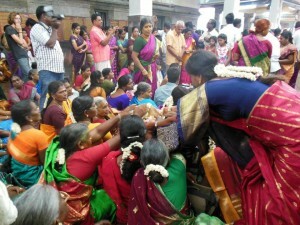 I took the train from outside the airport to the Egmore area (17 Rupees). The train was crowded, but having been baptized in Mumbai previously (which was far more crowded and cut-throat to get on or off), it was an easy ride. I settled in the Triplicane neighborhood and shared a 450 Rupee room with a young Japanese boy I had met on the plane. The couchsurfing group in Chennai is very active, so some of them came out to hang out a few times. One member invited me to his wedding although we had never met in person. I went to the temple on the wedding day, but there were well over 50 weddings happening at the same time! So I could not find his party. But I was adopted by another party who had nothing to do with me, and I observed the wedding and even ate lunch with them. This is Indian hospitality, everyone. After Chennai, I took a night train (12 hrs) to Guntakal. From there, I took three buses which took another 5-6 hours, and finally reached Hampi. It is one of the largest open air museums, with ruins everywhere and most of them free to enter. I took a bike tour for 350 Rupees. It was good, but having been to Cappadocia in Turkey, it is pretty hard to feel the same magnitude of excitement. Sure, Hampi is Hampi, Cappadocia is Cappadocia, but… Hampi has a big pot scene with many tourists who look like hippies, but mostly the young crowd. 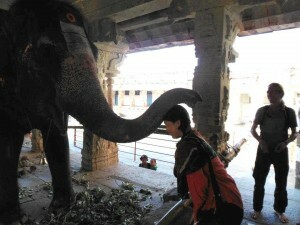 The highlight of Hampi for me was meeting (and touching) the temple elephant, Lakshmi!! If you give a 10 Rupee note, she gently takes it with her trunk and blesses you by touching your head with her trunk!! She is massive, but makes no sound when she walks. And the way she walked had a funny swing to it, she was just so cute! From Hampi (well, really from the town of Hospet), I took another night train to Hyderabad, again a 12-hour ride. After reaching the train station at 6:45am, I took the city bus # 127 to Jubilee Check post, where the couchsurfer Arun came to pick me up. As he had to work that day, I took buses into the Old City part. This involved three buses and 90 minutes. In cities, the points of interests are spread out, and couchsurfers tend to live outside the center, so this was expected. The Old City was very authentic. Charminar (4 pillars) offers a great view from the top. There are big pearl and silver/gold jewelry areas, but the merchants hardly ever approached me. So I was able to browse and look around in peace. This night, around 7pm, there were three bomb blasts about 10 km from the Old City, which took the lives of 30 some people and wounded 50 more. By this time, I was back at the couchsurfer’s house, and only came to know about it by a phone call from a friend. My host came home with carry-out food since going out into the street involved many police check points. The next day, public transportation was back to normal, so I went to Golconda Fort (again, three buses and 90 minutes ride). I like forts. I was completely in heaven when I had visited Rajasthan for this reason. But the Golconda Fort was equally great. 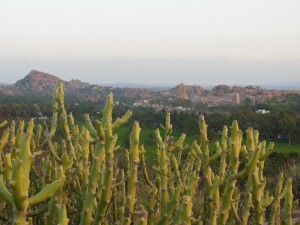 It offers a 360-degree panorama view of the city of Hyderabad. In one area, you can see modern high-rises and domes of the old mosques behind the fort wall – I think this view represents today’s Hyderabad very well. But the heat and dehydration took a tall on me – on my 3rd day here, I had a massive headache and felt exhausted. So I slept the whole day away – and wrote this.